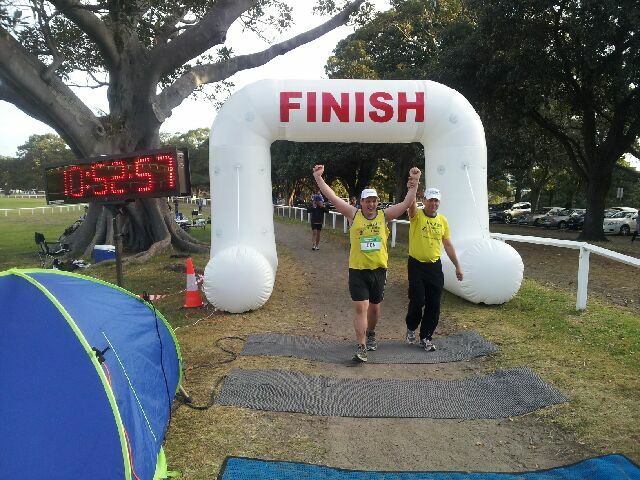 Two weeks ago Ben and I were at the start of the CPultra100km race in Sydney’s Centennial Park. We had a well planned strategy and I was confident that if we stick to it we will finish the 100km in the 12 hours required. Starting at the end of the field allowed us to have all available space we needed to navigate the uneven, which was of course an extra challenge for Ben. With an overcast sky we made good progress and cruised along at an average 6.45min/km. 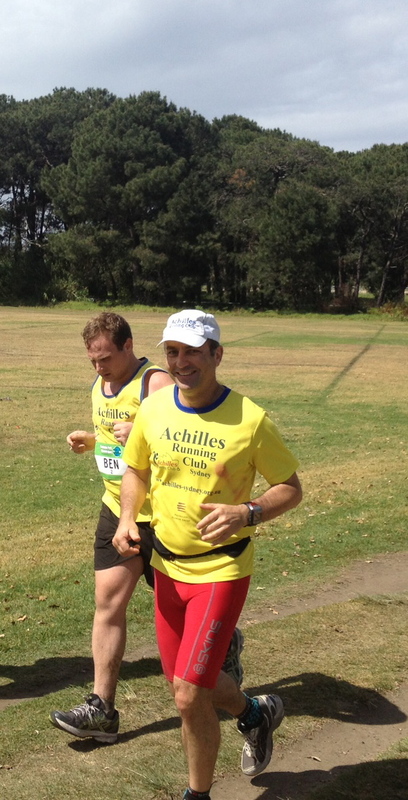 By 8am – two hours into the race and well within the planned finishing time we got company from our friends from Achilles. 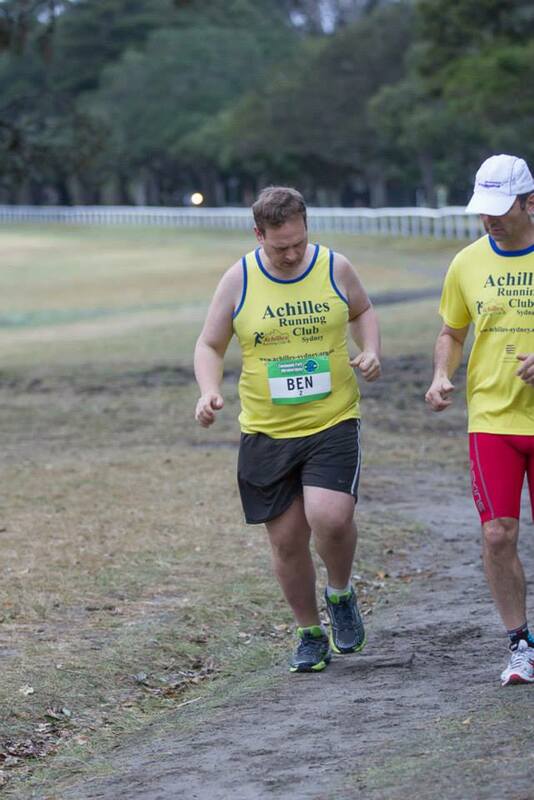 On a regular interval some Achilles member would join us for a round or two and for the next hour or so we had strong verbal support from the sideline as well from all the Achilles members walking and jogging around the park. 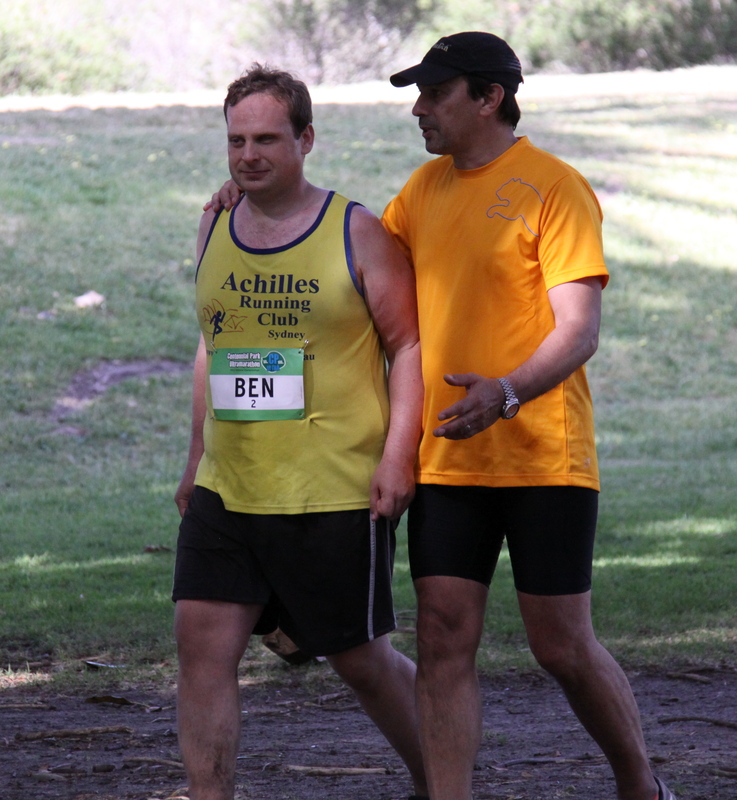 By 10 am I could feel that Ben started to slow and every time we dropped below the required pace he needed some encouraging words to pick up the speed a bit. After 10 rounds of 3.5km we had Phil joining us. Phil was an extreme help to me by taking over 1 or 2 training sessions each week with Ben, giving me some more time to spend at home and also train for myself from times to times. 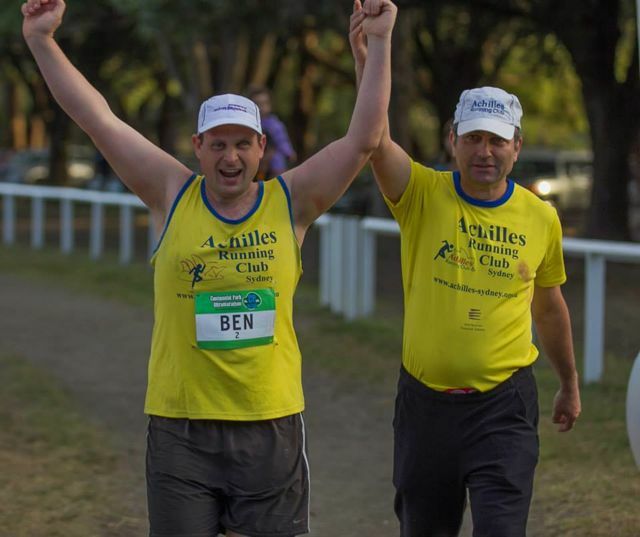 With almost 5 hours gone we crossed the time mat at 4 hours 52 minutes for 42 km – this was Ben’s best ever marathon time and we were still going even so he now started to following behind and I had to start pushing harder with every loop. Since we are well on track for a finish under 12 hours we agreed to have a lunch stop for some soup and a change of gear. 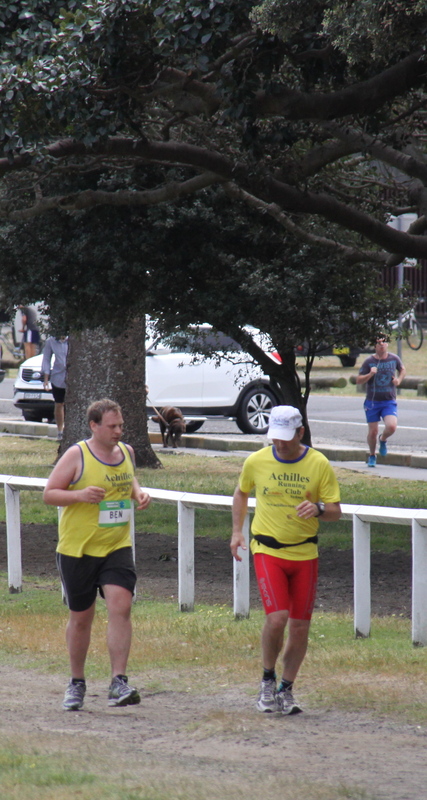 I knew Ben was looking forward to sitting down but at the same time I was wondering if he will be getting up again and pick up again where we left – 50km in 5hrs50min so just 10 min up our sleeves for the second half. After a short break we took off again….slower. It did not take long for Ben to complain about pain in his ankle – he had some issues with his right foot for a while from his last 100km trailwalk and since we pushed now clearly at the limit of his capacity I started to be worried that continuing would actually make more damage then good, however Ben got distressed when I offered to call it quits, so we kept going. But the stain clearly became too much and 65km into the race Ben had to stop running but he did not want to stop the race yet…so Phil and Ben continued walking slowly around the park and after another painful 3 hours – 10hrs52min after we started Ben finally threw the towel – 21 rounds or 75km later. This was one loop of 3.5km more then he managed at last years CPultra. 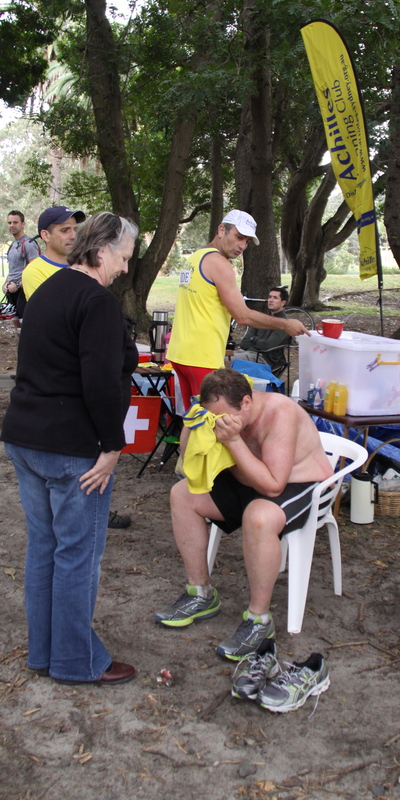 He was in pain and I was wondering what this will do to our preparation for New York in 6 weeks. Time will tell – at the moment Ben was not happy because he wanted to do more and he felt he let me down with all the training we did, but I say a big improvement from last year when it took him 12 hours to run the 71km, so congratulations to a new PB! New York – her we come! 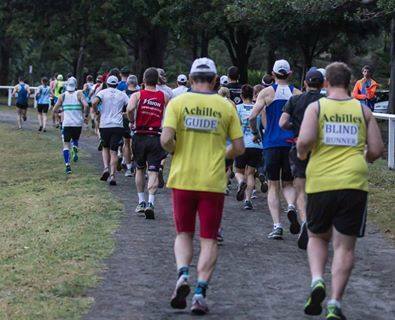 This entry was posted in Updates and tagged achilles club, racing, sydney, ultra marathon by run4vision. Bookmark the permalink.